Drive, and take the tollway—it’s quickest (and should take about three and a half hours). 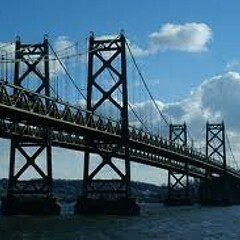 I-74 is the main bridge between Moline and the Iowa side. The Hotel Blackhawk (203 E. Third, Davenport, 888-525-4455, hotelblackhawk.com) is newly remodeled and looking swanky, but there are options from B&Bs to budget motels at visitquadcities.com. Joe's Club (1402 W. Seventh, Davenport, 563-324-0087) is a bar owned by Joe Seng, an Iowa state senator and veterinarian who on Friday nights plays piano and sings; his guests sometimes perform as well. It’s an older crowd, for sure—you might catch my mom on drums—but most everything on the menu, including beers and shots, is a dollar (the tenderloin and burgers went up to $2.50 not long ago). 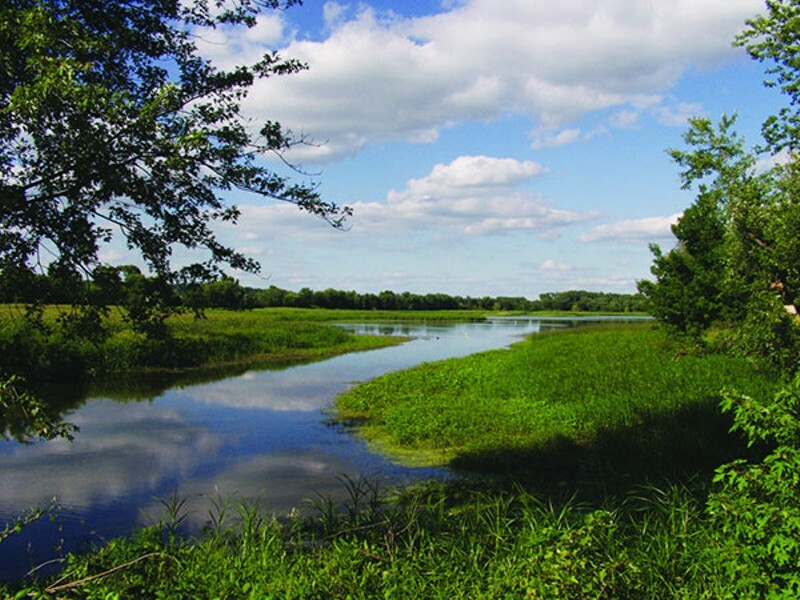 In addition to Blackhawk Park, as the locals call it, there are natural attractions including Davenport’s Nahant Marsh (nahant​marsh​.org), a large urban wetland; check out qc​wild​places​.com. Lake Davenport isn't blue or sparkling. It isn't even a lake—just the muddy Mississippi as it flows past Davenport, Iowa. The Lake Davenport Sailing Club, founded 1935, hosts races on the river Wednesdays and Sundays, Memorial Day through November. 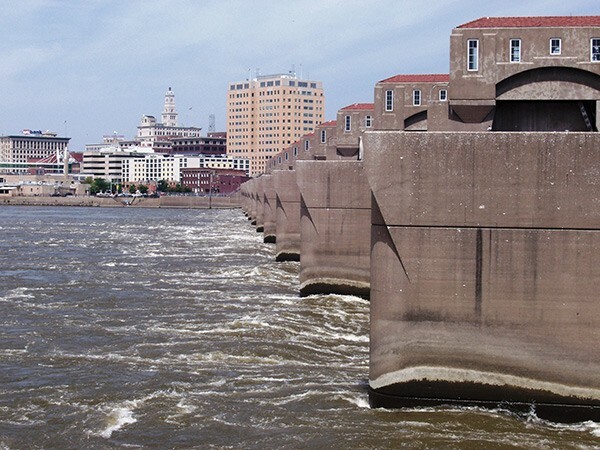 One of the first things beginners learn is to steer clear of the dam downstream, past the old Wonder Bread factory. About three and a half hours away by car, the Quad Cities is a modest metropolis (pop. ca. 380,000) that consists of Davenport and Bettendorf on the Iowa side, Rock Island and Moline across the water in Illinois. I grew up in Moline, and the closest I ever came to sailing on the Mississippi was doing some underage drinking in the Lake Davenport parking lot, but to me the club sums up the Quads quite nicely. There's nothing glamorous about them ("the place is right out of a Springsteen song," another native remarked to me recently), but they're plucky, even adventurous, and not without a sense of humor—midwestern river cities through and through. Near where the Rock River empties into the Mississippi is a tricky stretch once known as the Rock Island Rapids, which gave rise to the profession of riverboat piloting; in an earlier time there was barge and steamboat traffic in addition to the railroad. Now the Rock Island Line doesn't even connect with its namesake, and while barges still float past the area's five bridges, the riverboats are mostly given over to gambling—there are casinos in three of the Quad Cities (East Moline, the often-overlooked fifth, has an OTB). More to my taste is Davenport's oft-flooded but jewel-like riverfront baseball stadium, built in 1931 and now known as Modern Woodmen Park. Over the years it's housed A-level affiliates of ten teams, including the Cubs (1974-'84) and the Cardinals (2005-'12), but its present inhabitants, the Quad Cities River Bandits, are a farm team for the Houston Astros (go figure). It being Iowa, there's actually a plot of corn growing down the left-field line. Once the crop's tall enough, the players enter the field through it, a la Field of Dreams. Like other cities in the Rust Belt, the Quads have tried to reinvent themselves, setting up riverfront entertainment districts with attractions such as brewpubs and art galleries, Moline's iWireless Center (home of minor-league hockey team the Quad City Mallards), and Davenport's Figge Art Museum. The John Deere Classic, a PGA stop, has raised both its purse and its profile in recent times; at this year's, July 7 through 13, reigning champ 20-year-old Jordan Speith will be back to defend his title. More exciting to Chicagoans might be the Quad Cities' relative abundance of the topographical feature we're most deprived of: hills. Rock Island's Black Hawk State Historic Site has six miles of hiking trails with a rating of moderate difficulty thanks to the steep climbs. At the park's Singing Bird Nature Center there's what in my experience is an excellent bluegrass jam the first Sunday of every month from 1 to 5 PM. 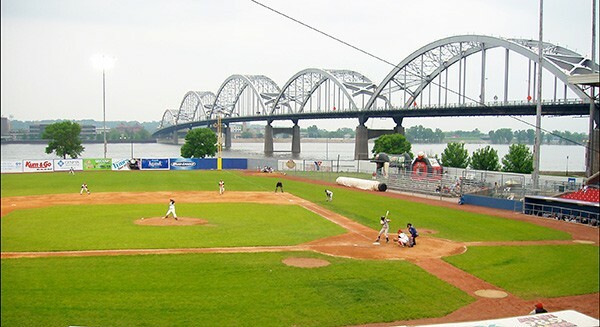 Modern Woodmen Park, currently home to the Quad Cities River Bandits, dates back to 1931 and features a cornfield along the left-field line. Better known is the Quad Cities' annual Bix Beiderbecke Memorial Jazz Festival, named for the alcoholic "young man with a horn," a Davenport native, and devoted to "traditional jazz," i.e., white-people Dixieland; this year's runs July 31 through August 3. That's upstaged by the Bix 7 Road Race, which draws more than 20,000 runners. This year, its 40th, the field includes Boston Marathon winner Meb Keflezighi among the pros, but anyone can up and do it—registration runs through Friday, July 25, for the race the following morning starting at 8 AM. It's a good idea to be active if you spend any amount of time in the Quad Cities, because if they're recognized for anything these days, it's pizza and ice cream. Since 2011, West Town's Roots Handmade Pizza has been serving a hipster version of so-called Quad Cities pizza. 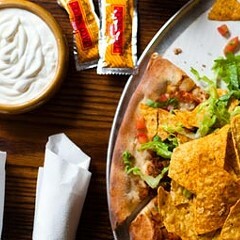 The pizza from Quads minichain Happy Joe's is both authentic and distinctive; it's cut into wedges, and the signature taco pizza comes with little packets of hot sauce, the addition of which sounds otiose, I realize, but is in fact trashily delicious. It was my dad who liked what's now being touted as a distinct regional style typified by Rock Island's Harris Pizza: thin crust, blanketed with toppings mostly underneath rather on top of the cheese, and cut into long, narrow, unwieldy strips. Beginning sailors quickly learn to steer clear of the lock that lies downstream from the Lake Davenport Sailing Club. As for ice cream, Happy Joe's is also an old-fashioned parlor serving gigantic sundaes, and Lagomarcino's, in downtown Moline, is a Beard Award-anointed soda fountain and confectionery around since 1908. But the heavyweight in every sense is the local chain Whitey's. For a quintessential Quad Cities experience, go to Clint's Pizza—founded by an erstwhile Harris employee and conveniently located in a bowling alley—and chow down on a large Canadian bacon and sauerkraut while knocking down a few pins. Then head over to Whitey's for a chocolate-banana-Butterfinger shake or a couple scoops of proprietary Moose Tracks. Should you feel the need to make your own tracks after indulging, the playing fields and tennis courts of my alma mater, Moline Senior High, are right next door. Correction: This story has been amended to correctly reflect that the Quad City Downs no longer has harness racing, that the Figge Art Museum has been around since 2005, and that the packets of hot sauce accompany Happy Joe's taco pizza specifically.